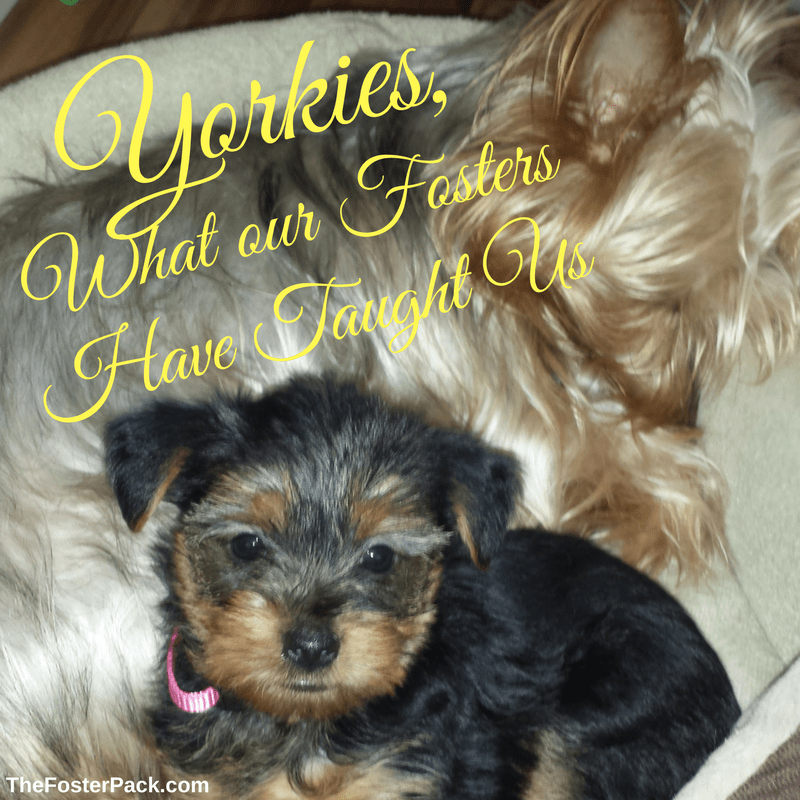 Home > Animal Shelter Volunteering > Animal Fostering > Dog Fostering > Yorkies, What our Fosters have taught us. I always thought Jack Russell Terriers were one of the hardest to handle dogs. Having four of them in our household has been a test of wills over the years. The jumping abilities, the extremely high energy, the unending demand for attention and playtime. 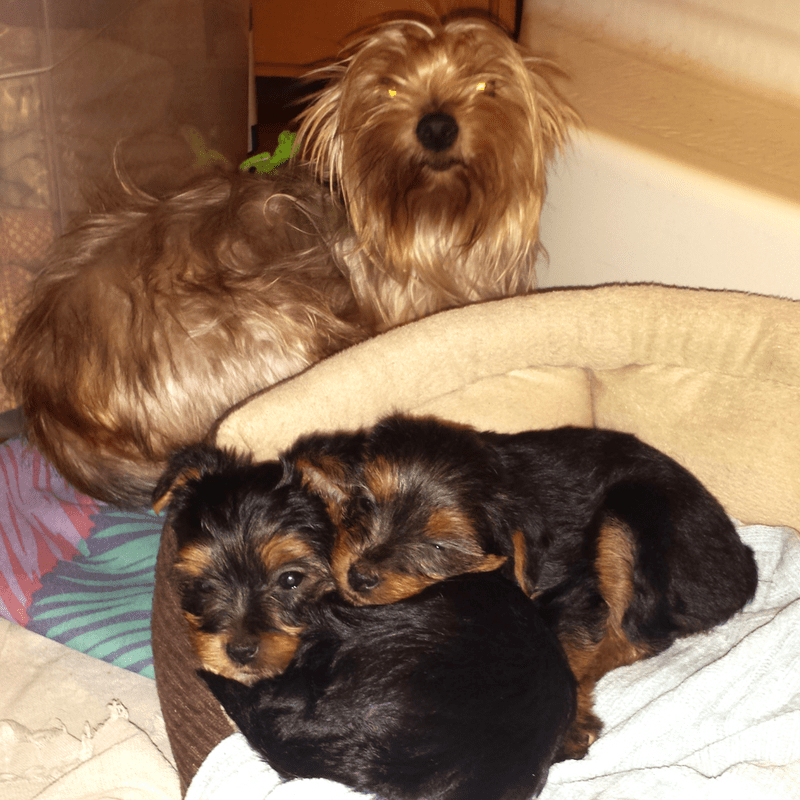 But having had a 5 yr old Yorkie, Maddie, with no training, for the past three months, and her 4 puppies for 2 months, has taught us a lot about Yorkies. And frankly, she is much harder to handle than any of our JRTs, or even all four together. Our Jacks are also trained though. And Maddie never was. She was housebroken, and she now knows sit and stay, since we taught her. She listens when she feels like it, of course. But we are making progress. Our Jacks can jump, all 4 of them, high. But Jackyl, the full-blood JRT has always been the best jumper, Santana, Beagle/JRT Mix comes in a close second. Even at 10.5 years, Jackyl can be sitting at my feet and jump straight up to give me a kiss on the face. Maddie can out do him, and land on my shoulder or head, usually without warning. ave just hanging over the edge. But he’ll take anything he can get his teeth on. His last incident netted him a loaf of just our of the freezer, frozen bread. He still ate at least 4 pieces before we got out there to take it from him. Maddie just jumps and lands on the counter. She doesn’t get into much. She’s not real food motivated. Although, she has a fondness for butter. Real salted butter. She leaves alone everything else on the counters, except the butter. Even an open bag of chocolate chips. She bypassed it and went for the butter. An open bag of beef jerky, untouched. Another stick of butter consumed. Maddie also seems to have the ability to drop out of the ceiling, and into my lap. No matter where I’m sitting she can come up over my shoulder and land in my lap, all curled up in her little ball, like she’d been there for a while. She’s so quiet too, that she always catches me by surprise. Although a lot of that is because she has no tags on her collar, and our own dogs each have a few. Their bling, we call it. It helps hard-of-hearing me hear them when I can’t see them. There is no gate or playpen in the house that can hold her back. She can jump even our 36-inch gates without hardly touching them. Of course, our younger male JRT mixes, Santana and Pantera, can get over the gates too, but they know better than to do it unless told to. Jackyl has never tried to jump a gate. He prefers not to expend the energy unless it will get him food. The 24-inch playpens are like nothing to her. Only a solid door can contain Miss Maddie. We’ve even tried to put her in a 10ft outdoor dog kennel, she was over it and to me as soon as I stepped out. She climbs as well as she jumps. She’s fast too. For such a little, kind of girly, dog, she sure can run. Luckily, not faster than our boys though. Jackyl, Chewy, Santana, and Pantera can all outrun her. So when she darts out the door, we usually send Chewy after her. He herds her back to the house for us. She came to us with a litter of 4-week old puppies. So she was in Mama Mode when we met her. But she took over the house and the pack with ease. She bosses the other dogs around, and they let her. Even Chewy, who thinks he’s top dog around here, bends to her will. He bends to Meaty’s too, she also came to us with puppies. Maybe Chewy just has mama issues. But Yorkie’s do have attitudes. Big attitudes for such little dogs. Even the puppies already did when they left us at 11-weeks old. They were also the noisiest, most demanding puppies we’ve ever had. Those little high-pitched barks, especially when they all started barking together, could make your ear drums bleed. When Miss Maddie came to us, she was a very light silver and tan. She’s been with us 3 months now, and her roots are coming in black. Really black. Her babies were black and rust, but then they started to turn silver as they aged. I’ve never seen dogs do this before. I’ve never seen dogs do this before. I have received foster dogs that I thought were brown and after a bath found out they were white. And I’ve watched some of the older dogs turn white in the face. But I have never seen a young adult dog change colors before. 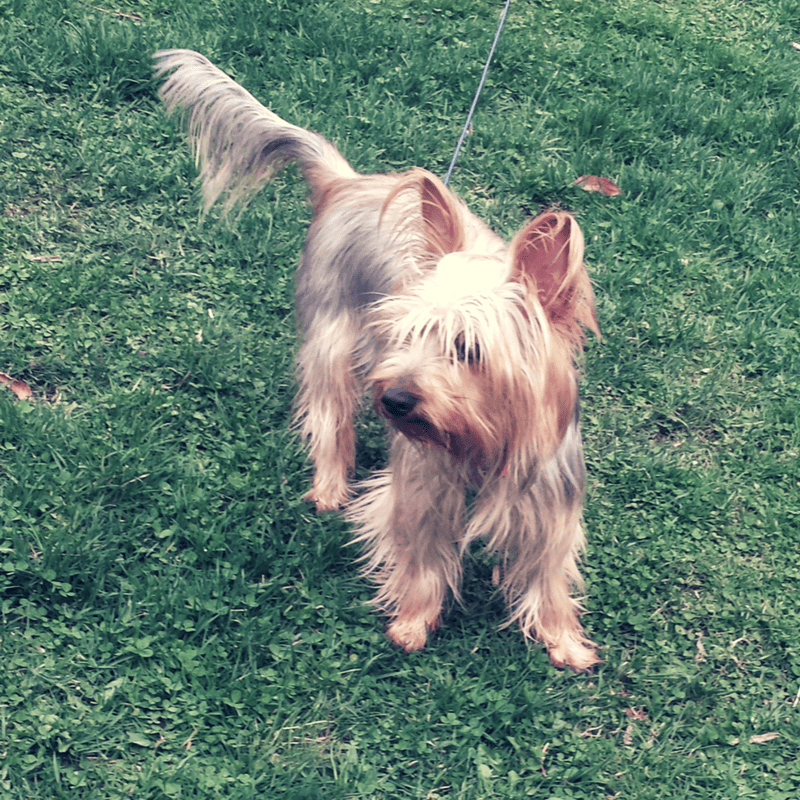 Yorkies are not to be underestimated. 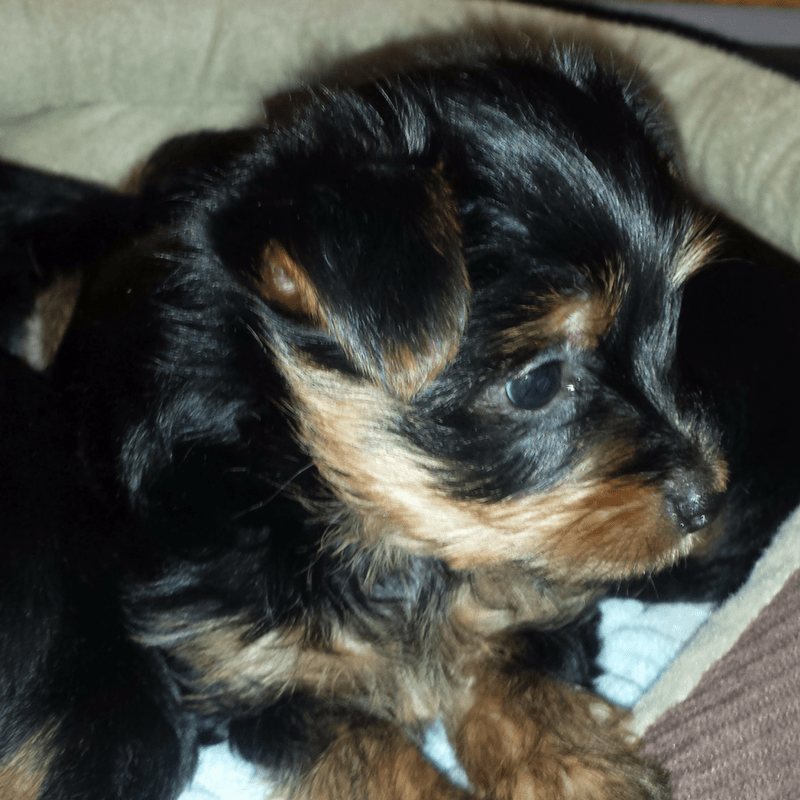 All in all, we have learned NOT to underestimate these fluffy, little adorable Yorkie dogs. They may be little and cute, but I have a new respect for anyone that has one. And especially for anyone who adopts an untrained Yorkie from a shelter.